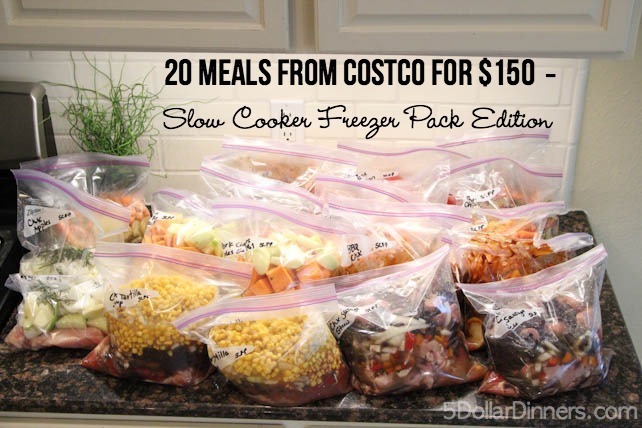 This recipe is part of the 20 Slow Cooker Freezer Packs from Costco for $150 meal plan. Note that this is written as a single recipe, but is doubled in the Costco meal plan, so you will have enough ingredients to make 2 packs. ¼ of the stew beef, about 1 lb. Assembly Instructions: Add all ingredients to the pack, in the order they were listed. Remove as much air as you can or vacuum seal the pack. Freeze up to 6 months in a refrigerator freezer, or 12 months in a deep freezer. Cooking Instructions: Thaw the slow cooker pack in the refrigerator overnight, or in a bowl of warm water for about 30 minutes. If the pack is partially thawed, cook on low for 8-10 hours. If the pack is completely thawed, you can cook on high for 6 hours or low for 8 hours. Side dish suggestion: This one-dish meal doesn’t need a side dish, unless you want to add one. I would suggest a simple green salad or broccoli. Is it 3 cups of beef broth that is used in this recipe? Would it be ok to freeze without the beef broth…and then add into the crockpot at cooking time? I’m thinking this would save room in my freezer. Thoughts? How often/when should I be stirring? Sounds good but I would not freeze the potatoes. Add them fresh because otherwise your potatoes in the stew will taste watery and mushy. I find that both potatoes and rice don’t freeze very well. Note: You can freeze mashed potatoes for other dinners, if you mix them with sour cream before freezing them. Oh I almost forgot, always add a bay leaf to the beef stew and it will taste better. Has anyone made this? How did it turn out? It is deliciously simple! One if my fav beef stew recipes. The potatoes freeze well, especially russett. Adding broth later is a great idea! Eh, this didn’t taste very good to us. I will say that the gold potatoes froze great. It was missing something overall though. We used chicken broth as she states. Maybe it needs beef broth. I doubt it will be made again. Loved making all the 20 freezer bags though. Fun afternoon with my husband helping me chop and cut everything. This was the first of our 20 we have eaten so here is to hoping the taste gets better. I think I will add some Worchestire sauce and Balsamic Vinegar to this to make it more tasty! my potatoes turned black. are they bad? from what i’ve read, you can’t freeze raw potatoes so are all my meals with potatoes bad???? confused why no one else is posting this??? ?